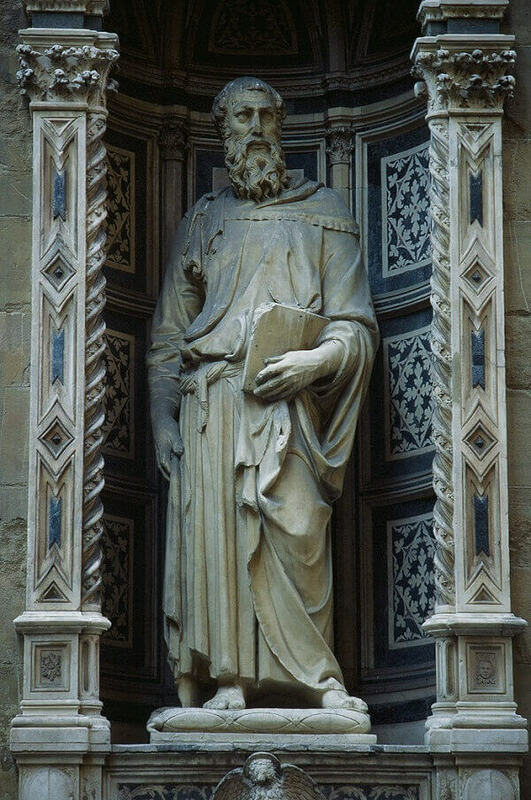 Donatello's Saint Mark was the first of three pieces completed for exterior niches of the church of Orsanmichele. It was commissioned by the linen weaver's guild and presented in completion between 1411-1413. St. Mark is revered as the creator of the Church of Alexandria. Donatello portrays him with a full beard and draped in traditional prayer robes. It was one of his earliest commissioned pieces and the extreme realism in the subject must have been surprising. He went so far as to prominently display the veins in St. Mark's hand as it clutches a text. Donatello placed his St. Mark in a "contrapposto" pose. His left leg is bent and his torso twisted while the weight of the statue rests on the right leg. This naturalistic style was infrequently employed until Donatello's more realistic statues became in vogue during the Renaissance. The piece is carved from marble and is a large tribute that stands at 93 inches tall. It originally sat inside a niche carved by local stone carvers Albizzo di Petro and Perfetto di Giovanni. In "The Lives of the Artists," a text written by Vasari, it was recorded that the sculpture was first rejected when placed at street level. Donatello had created a larger head and torso because when the statue was placed high up on the church wall it would look more natural to a viewer. Donatello pledged to make adjustments after the rejection. Instead he obscured the statue for 15 days and had it moved higher up so that the viewer was looking up at the piece. From this angle the proportions were appropriate and the statue was accepted.